A pilot scheme offering care packages for seniors has done well and will continue to expand, said Senior Minister of State for Health Amy Khor yesterday. There are 15 senior care centres offering such services under the Integrated Home and Day Care scheme, which started with five centres two years ago. The scheme is part of a Health Ministry effort to provide one-stop care packages for seniors with a variety of complex needs. Such packages could include home nursing care, transport to daycare facilities, meal delivery services and access to an after-office-hours helpline. There are 430 seniors under the scheme. 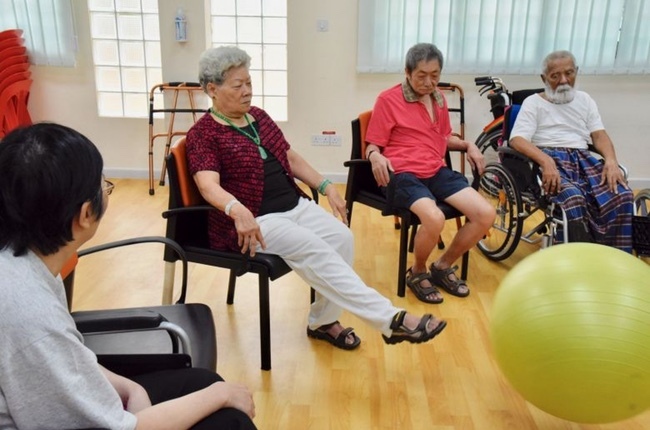 Speaking to reporters during her visit to Tembusu Eldercare and Senior Activity centres in Eunos, Dr Khor said the scheme gives seniors the flexibility to choose among different combinations of services to meet their needs. It also lets them grow old in the comfort of familiar surroundings, she added. "When we talk to seniors, I think most of them want to age in the comfort of their homes," Dr Khor said. The Health Ministry plans to expand the scheme to a few more centres by 2020, she added. "Then, we will evaluate the outcome of this project and decide if we should scale it up further, and how we ought to scale it up," she said. Dr Khor also gave updates on eldercare and the Health Ministry's plans to ramp up infrastructure for seniors. As of late last year, about 14,000 seniors were using subsidised home and community care services, while around 10,000 were in nursing homes. Dr Khor also said the Government is on track to meet its targets to provide 6,200 daycare places and 10,000 homecare places by 2020. Last year, the ministry added 1,000 daycare places and 500 homecare places.